Americans used to worry about job loss because our manufacturing jobs had turned into lower-wage positions as Walmart greeters or cashiers selling made-in-China goods. Then we worried about job-loss as the Walmart greeter and cashier jobs turned into temporary jobs picking out orders at Amazon warehouses (or overseeing robots that did that). Now we're approaching the day at which we don't need either the Walmart store or even the American-based Amazon warehouse or distribution center. Instead, the item just gets mailed directly to your house by some low-wage worker in China. Please check out the full column at the New York Sun (here), the New Boston Post (here), Reason (here), and Newsmax (here). 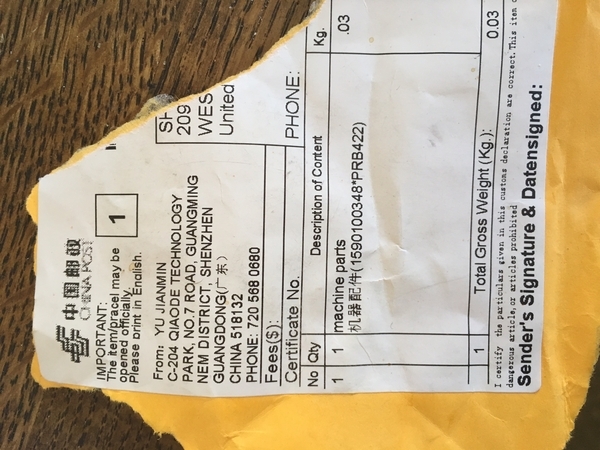 The mailing label from an item ordered from an Amazon seller that was shipped directly from China to an American customer.